The Korea Herald is publishing a series of articles highlighting South Korea’s promising startups in the emerging sectors of digital health care and next-generation medical devices. This is the 11th installment. -- Ed. Every year, around 15 million people around the world suffer from a stroke, according to the World Health Organization. Among them, approximately two thirds are said to survive and require rehabilitation. Rehabilitation helps stroke survivors relearn key motor skills that are lost when that part of the brain is damaged. Needless to say, it is often a lengthy, time-consuming, costly and demotivating endeavor, with many patients giving up their programs midway. One South Korean tech startup has set out to change this with a series of smart home rehabilitation products which uses a meticulously designed biofeedback gaming system to motivate and empower recovering patients throughout their rehab programs. Neofect’s flagship product is the Rapael Smart Glove, a flexible robotic glove fitted with sensors to capture the patient’s motion and measure the degree of finger and wrist movement. The medical device, launched in the US, Europe and Korea, is available for rent by individuals to use. The smart glove connects to a software via Bluetooth, with which patients can practice various motor movements by playing games, whether it be simulating daily activities like pouring a cup of juice or strengthening wrist movement by virtually piloting an airplane. 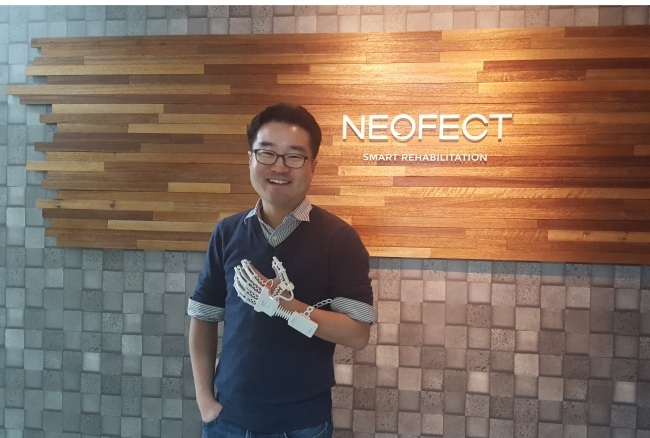 “We offer around 50 games in total, all carefully developed by our team of rehabilitation experts and game developers to maximize clinical benefit and interest for patients,” said Neofect’s CEO and co-founder Ban Ho-young in an interview with The Korea Herald. “Compared to other rehab devices in the market, we’ve taken great care to break down each of our games by differing clinical goals and to make them as motivating as possible for the user,” he said. The price is set at $99 per month for individual home rentals, while purchase by hospitals is also available. While the motif has been to provide patients with a boost of enthusiasm, the Rapael system is also built to provide big data driven program planning and progress reports to optimize the rehab process. Powered by artificial intelligence, Rapael’s learning algorithm automatically adjusts the difficulty of the rehabilitation games based on the patient’s range of motion and goals. This ensures that the patient continues to stay challenged, while maintaining a positive, encouraging environment, the company explained. Ban, a mechanical engineer by training, co-founded Neofect in 2010 with his partner Choi Young-keun, a former classmate at the Korea Advanced Institute of Science and Technology. While studying at the Darden School of Business in Virginia, Ban joined Choi’s project to build a new business in the smart robotic rehabilitation market. For the Neofect CEO, the business is also personal. He lost his father to a stroke and experienced first-hand the hardships of rehab for both the stroke victim and families from his two uncles who also experienced a stroke. “Considering my circumstances, I’d always taken note of the need for new, efficient medical devices to help stroke patients recover and thereby decided to jointly found a new business in this front,” Ban said. 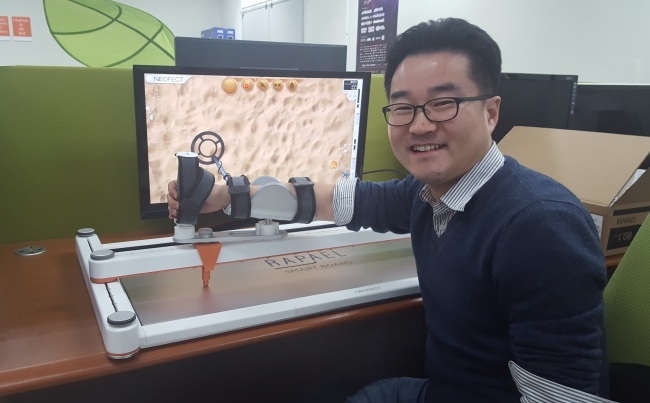 Encouraged by the success of its smart glove, the Seoul-based tech startup recently rolled out a children’s version of the Rapael Smart Glove, a Smart Board for upper limb training and a Smart Pegboard for upper body rehab and visual, spatial cognitive training. In the case of the digitized smart pegboard, it is the first of its kind to ever hit the global market, according to Neofect. It features games like “smack-a-mole” where players must insert a peg in a lit hole before the light disappears. Until now, the pegboard was an analogue device — a wooden or plastic board with holes where pegs are inserted — designed to strengthen the patient’s upper limbs and improve cognition. By going digital, Neofect’s smart pegboard automatically measure markers that were previously measured manually by a therapist such as how long it takes to insert one peg after another, Ban said. “We believe that our new digital smart pegboard can aid not only stroke patients but also those with cognitive disorders such as Alzheimer’s,” Ban said. Looking ahead, Neofect is planning to introduce this year the Exo Glove Poly — a soft wearable robot for hand rehabilitation of patients who have suffered a spinal coordination injury. The firm is preparing to launch a Kickstarter campaign in October 2017. Since its foundation, the Korean tech startup has raised some 10 billion won ($8.76 million) from various local venture capital firms, including POSCO Venture Partners, DSC Investment, K Partners, SBI Investment and Sejong Investment.